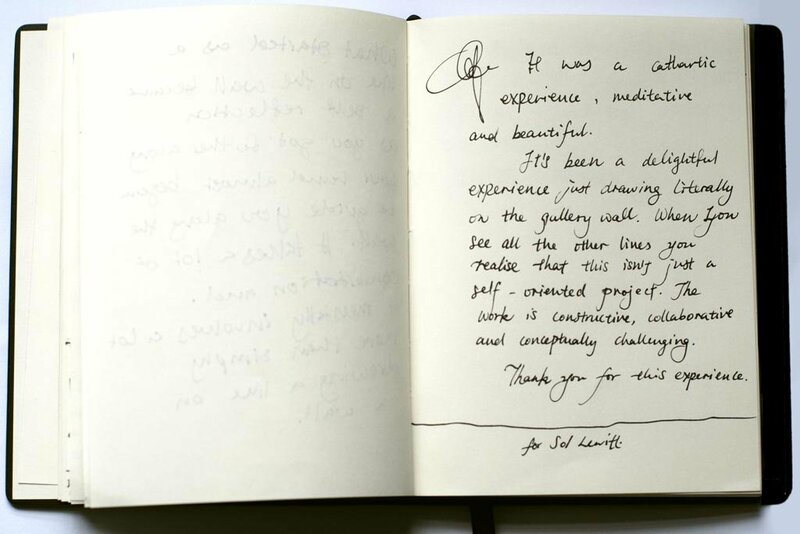 Over four days last month we created Sol LeWitt’s Wall Drawing #124 at the Gallery, and by ‘we’ I mean 113 members of the public. 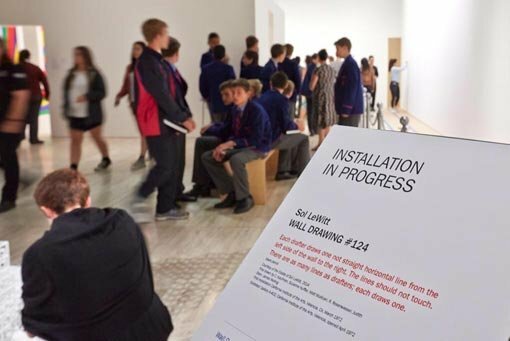 Whereas the wall drawings in the exhibition Sol LeWitt: Your mind is exactly at that line were created by trained assistants from the LeWitt studio in Connecticut working with Gallery staff, Wall Drawing #124 was conceived with student participation in mind. One of the founders of conceptual art, LeWitt believed it was the idea that counts, and separated the design from its fabrication. The line must be not straight and horizontal. The line must be drawn from left to right. The lines must not touch. Each drafter draws one line. Seems pretty straightforward, right? As later drafters will attest, following these instructions in fact became increasingly difficult, especially when trying to navigate through tight spaces without touching nearby lines – all the while maintaining a steady hand on a bumpy wall. The following slideshow, which includes comments written by some of the drafters, gives a sense of the experience. For the early drafters, it’s fast and exhilarating; for the later participants, it’s slower and more contemplative. The shifting physicality of the process immediately becomes apparent, not to mention the collaborative nature of the work. 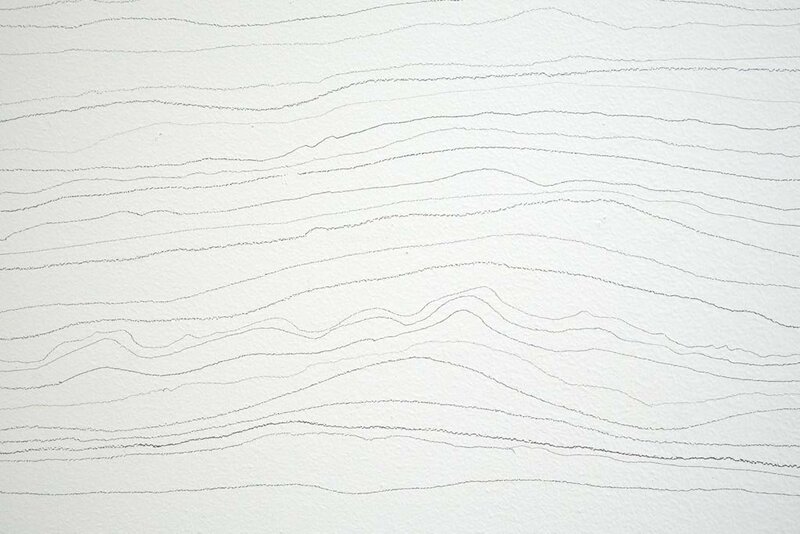 That’s the beauty of a Sol LeWitt wall drawing. Thanks to everyone who helped install Wall Drawing #124 and for keeping your mind exactly at that line! 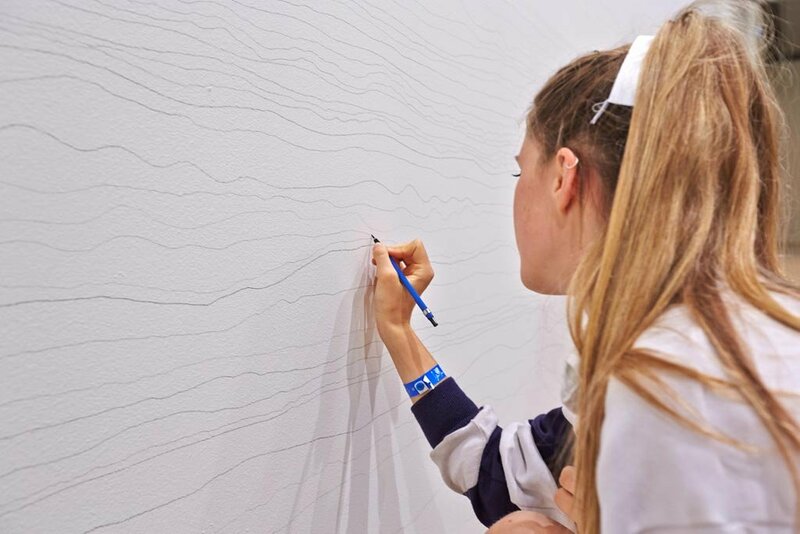 A student carefully draws her line on the wall, making sure not to touch the lines on either side. She is also trying to apply a consistent pressure and often rotates the pencil to keep the line a consistent thickness and hue. 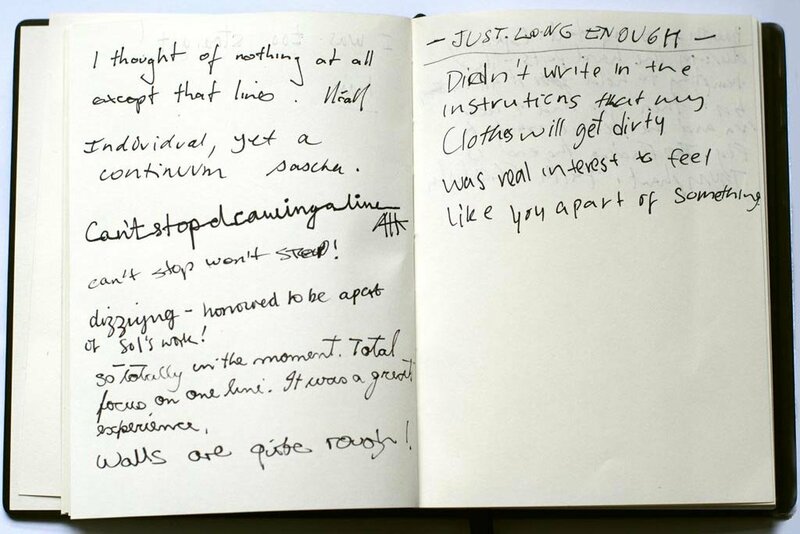 Notes from the drafters’ comment book: ‘It isn’t just a line, it’s an artwork.’ These drafters were some of the first to draw a line. Here students are warming up before they draw their line on the wall. One student is making her pencil lead even and rounded. If it’s too sharp, it will gouge the wall. Another student is practising drawing a line close to another without touching it, all the while maintaining even pressure. 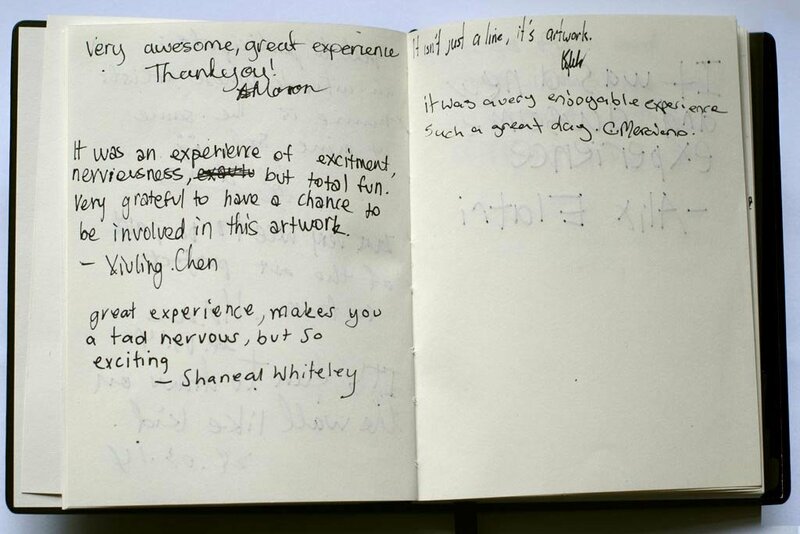 As the comments book reveals, many drafters were surprised to find how difficult it was to draw a consistent line on a bumpy wall, not to mention how much concentration was needed to get to the end of the wall. Here you can get a sense of the length of the wall. Some drafters needed to take a break at various points, which LeWitt said was OK as long as the join was completely seamless. 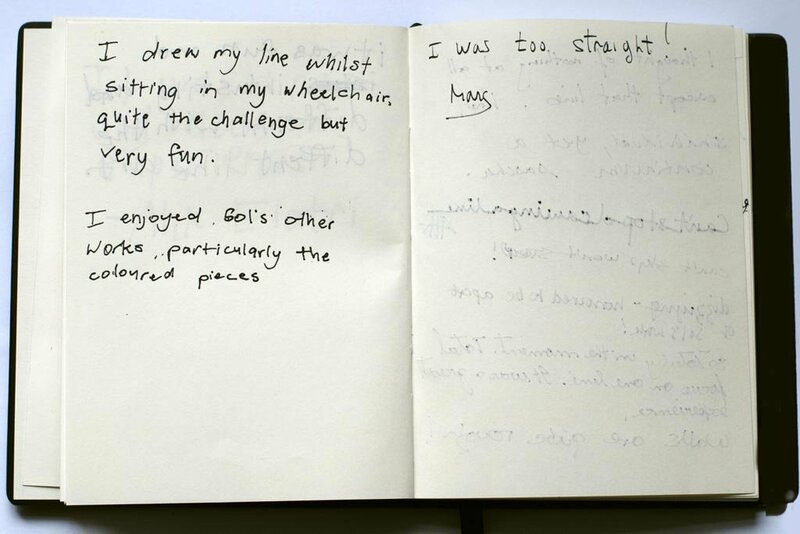 One drafter drew a line from her wheelchair. Facing backwards, her carer pulled her slowly and steadily down the length of the wall. The line was one of the most consistent non-straight horizontal lines on the wall. Tall drafters typically found they had more room to draw their line, but holding an arm up was tiring. In a way, the drawing maps out the average heights of drafters. 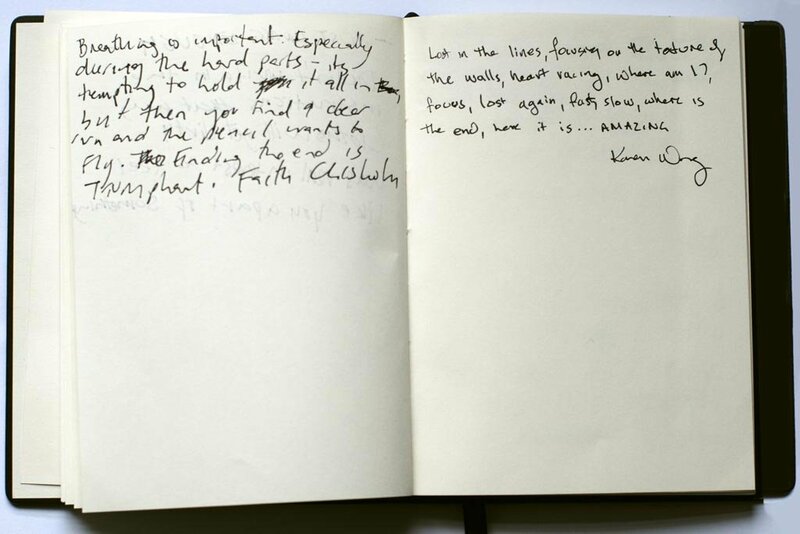 Two drafters share their experience in the comments book and reveal the physicality of drawing a line; the breathing, concentration and, finally, the triumphant end. Some drafters drew their line further down on the wall. It was interesting to see the various positions people took to steady their hand and to hear about the effect this had on their body when they were finished. 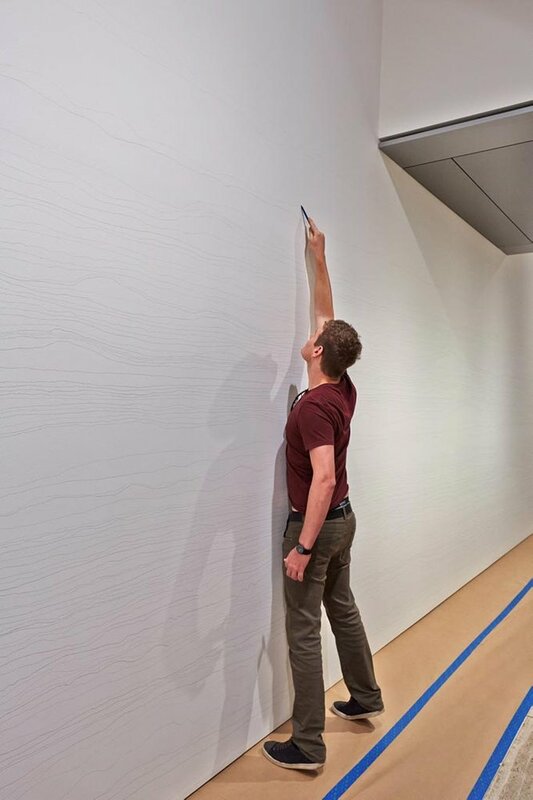 One person commented that doing a LeWitt wall drawing is very bodily, which isn’t apparent when you’re looking at the finished work. 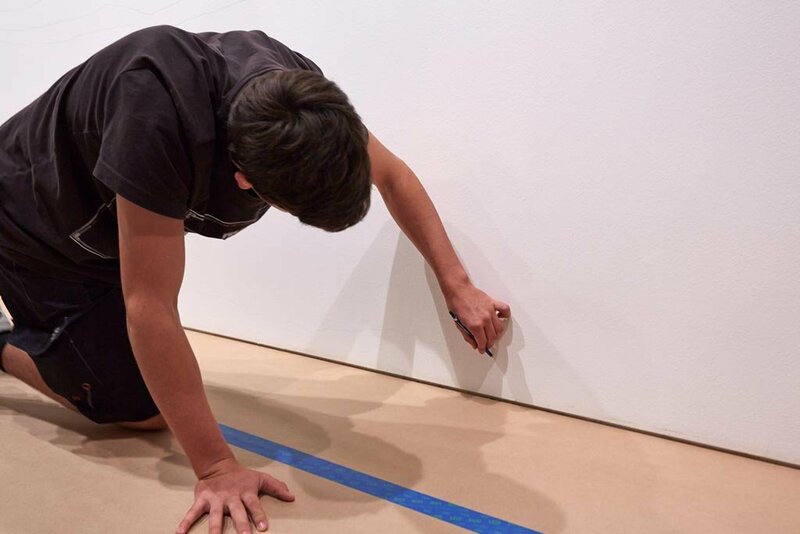 Even though the actual process of drawing a line was a highly individual and meditative experience, drafters felt they were part of a collective project. 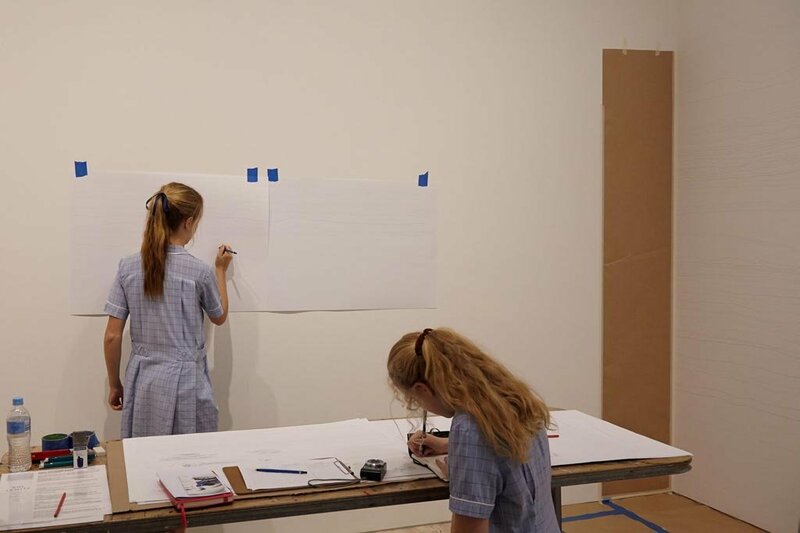 LeWitt’s practice is very much a collaborative one. We finished the wall drawing after four days when we could no longer draw any more lines without touching another one. 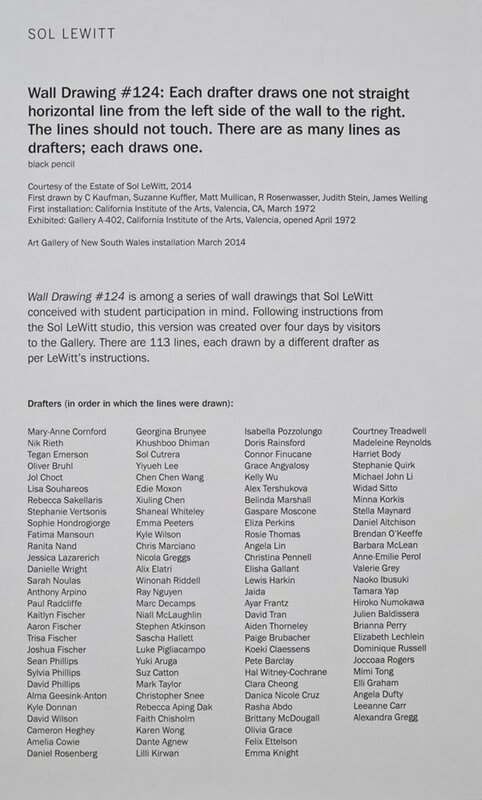 All 113 drafters are listed on a wall label in the Gallery. A close-up view of Wall Drawing #124 reveals each individual’s thought. Click on one of the small images to start the slideshow.